Do you ever find it difficult to hire a contractor that handles the small projects? Deck repairs are, to me a small job vs. building anew deck. Recently had a new client call me asking me if I’d do some deck repairs in West Glacier, MT on a vacation property. I was happy to oblige. 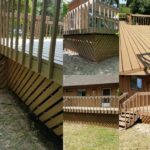 He had three contractors come and look at the work and they all would not do the repairs but they were more then happy to give deck replacement estimate. Are you kidding me, I just don’t understand that type of thinking. I like making recommendations to my clients and help them make good choices to get the results they are looking for. 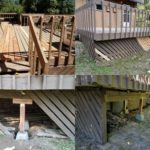 This particular project the client got what they wanted, deck repaired and not was recommended by the three contractors who would not bid on the repairs. Above are before and after photos of this project. I have, over the years acquired many skills to help you improve or repair your home and can take care of those small jobs around your house so you don’t have to. I can save you time and add peace of mind for you knowing your home is in good hands. Here are just a few of the small jobs we are real good at. Happy to report that after spending a couple thousand dollars on deck repairs vs ten to fifteen thousands dollars on a new deck my clients will be able to enjoy for several more years. I love helping my clients achieve the desired results on many different types of small home improvements and repairs. Want a free quote on your next small home repair?